Today, our writers want gratitude from you. They’ve really done the impossible - reviewed Shopware. Researching this cart, in the English-speaking portion of the web, is like researching Bigfoot. Everybody has heard of it, but no one can give even a remotely detailed description. We, however, being meticulous and nerdy, activated our investigative and testing powers to finally write a top-to-bottom Shopware review. Combining our impression, Shopware customers’ feedback and platform’s own feature descriptions we tried to come up with something comprehensive and unbiased. You’ll be the judge if we succeeded. Cart2Cart often boasts of its grand, wisdomy age - 9 market years, but in the presence of Shopware we should probably shut up - the platform is almost twice as old. Shopware people have already celebrated 16 years in business - which in e-Commerce years is like a thousand. That alone should indicate cart’s great quality - nothing shoddy could survive for that long in the competitive e-Commerce environment. 16 business years resulted in 54.000+ satisfied clients for Shopware, which again is a reliable testimony of platform’s greatness. The cart is advanced with a huge amount of elements to it, so, of course, there is a learning curve. However, once you get to know its administration ways a little, you’ll discover that Shopware is much easier than most open source platforms out there. Lots of modifications can be made from the back-end without actually touching the core code. The control panel, itself, is decent. A little polishing wouldn’t hurt, but, overall, it’s convenient. All features and reports you might need are accessible within one view, and each window can be expanded or minimized with one click on the icon in the bottom left corner. Shopware comes in four versions - a free, open-source Community one with the community support only, and three paid ones - Professional, Professional Plus and Enterprise - with gradually increasing feature-sets and Silver and Diamond Support Subscriptions. Silver Subscription, as Shopware puts it, allows to “take advantage of full support, free initial installation and free updates for your shop and all Premium Plugins”. The Diamond one - we can only wonder. The terms of it are established through contacting platform’s team directly. The main highlight of the free community version is flexibility - it's perfect for newbie businessmen with technical background. In the right hands, the platform can be perfectly adjusted to different business needs - it’s functionality is extendable to fully satisfy the requirements of small to mid-sized retailers. Browse the Community Store to find plugins you need. The larger-scale trade on Shopware, however, will require investments - and that’s where we hit platform’s main flaw - the price. Shopware isn’t designed for small budget businesses - the plans along with licenced plugins are expensive - the cheapest commercial version costs €1,295.00 (a one time fee). These prices are justified by reliability and impressive performance, according to all the happy Shopware store runners, but if you don’t have much funds to invest right away - you’ll likely want to settle on some other platform. 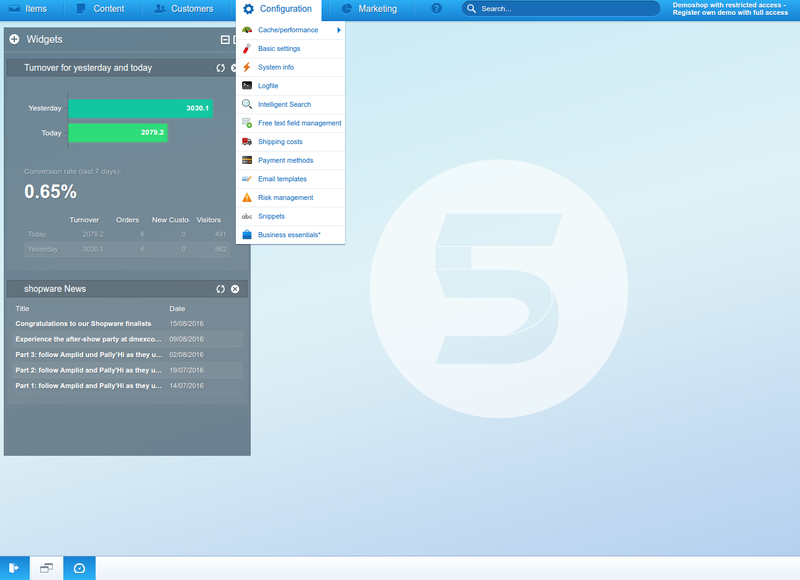 Responsive, stylish and easily customizable design is something Shopware can be proud of. During modifications, the straightforward editor only displays elements that are being customized and hides the rest - a brilliant feature in terms of simplicity. Cart’s Smarty Template Inheritance based template system allows to modify certain parts of design exclusively, without violating the base of your pages’ looks. On the front end, Shopware makes it easy for clients to find exactly what they want - products can be filtered by colour, size, reviews, price and shipping price etc. All of that is applicable to mobile shopping too - cart’s design is highly responsive. Also, customers on mobile platforms will enjoy all aspects of gesture control - the pinch zooming, touch buttons and sliders with momentum scrolling. Assign articles to Suppliers in a few clicks. These and much more functions are managed from a single backend - no need for any side plugins. Such system is very convenient for huge store owners - and a good stimulus for those who yet are running small retailers - c’mon, grow! Shopware is great - lot’s of modules even in the community edition, flexible configurations, simple design management, rich extension base and so on. However, you have to already be established before running it. Established technically - the cart isn’t friendly to tech dummies, and financially - pursuing high scale business on Shopware will cost you a lot. So, weigh these factors for yourself and decide if Shopware is your kind of cart. If the answer’s “Yes” - Cart2Cart will gladly help you migrate to Shopware in a few clicks. Try it for free via Demo Migration! 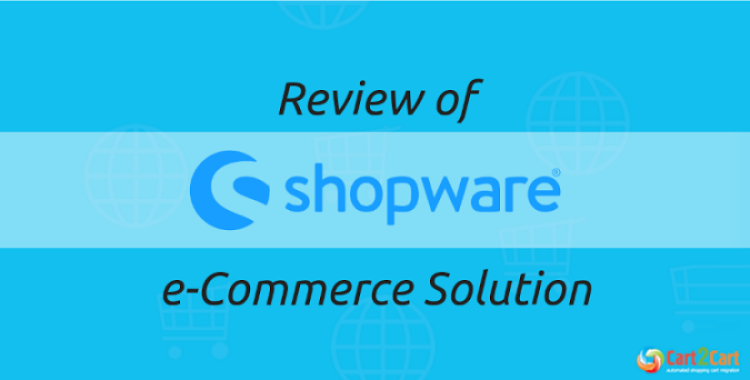 One thought on "Shopware Review - A Winning Hand in High-Stakes Game"